I decided to simplify the Cockney Star quilt block and at the same time reduce the bulk of (in my opinion) unnecessary extra seams. 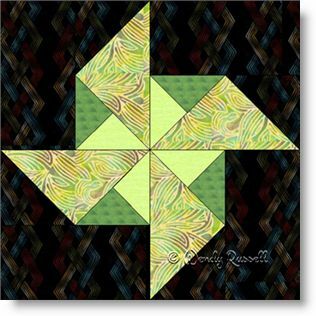 I created the large "pinwheel" patches using flying geese units rather than the original half square triangles. Likewise I replaced groupings of two squares with one rectangle. This makes for less sewing and a flatter block as there are fewer seams. So, because of these changes, I think this is a very easy four patch block to construct. The extra interest in this block is provided by the quarter square triangles which then produce a second smaller pinwheel in the centre of the block. As you can imagine, I like to have fun with the blocks, and what is more fun than making things easier? The two sample quilts illustrated use the common side by side and on point settings. Extra blank blocks have been added to showcase your quilting skills.